Just a head’s up…April Fools’ Day is THIS Sunday. Don’t let your friends fool you. Some historians believe the April Fools’ customs began in France, although no one knows for sure. It may stem from a calendar change in 16th century France — the moving of New Year’s Day from April 1 to January 1 when the Gregorian calendar was adopted. 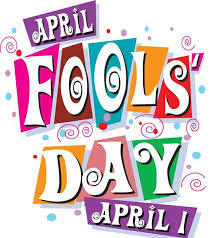 People who continued to celebrate New Year’s Day on April 1st rather than the new date of January 1st were referred to as “April fools” and others played tricks on them. In Scotland, April Fools’ lasts two days. Victims of pranks are called gowks (cuckoo birds). The second day is known as Taily Day, and pranks involving the backside are played. Supposedly, it is the origin of “kick me” signs. 1986-present – Press releases for the [non-existent] New York City April Fools’ Day Parade have been issued every year since 1986. April 1, 2016 – Google introduces “Mic Drop,” a Gmail feature that enables users to send emails with an animated gif depicting a minion dropping a microphone. The prank goes awry when people accidentally click on the button and unwittingly send business emails with the whimsical animation. The feature is removed after several hours of confusion. St. Patrick’s Day parade wasn’t held in Ireland, but in New York. Irish soldiers serving in the British army threw a parade to celebrate the holiday in 1762. These days, cities all over have parades full of traditional music and dance. Irish Bars Used To Close On The Holiday – From 1903 to 1961, bars in Ireland were all closed on St. Patrick’s Day for religious reasons. Can you imagine St. Patrick’s Day without a pint of beer? 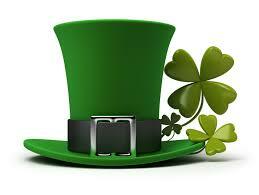 St. Patrick Baptized A Lot Of People – He is thought to have baptized 100,000 people. That’s a whole lot of ceremonies! St. Patrick Wasn’t Irish – He’s famed for bringing Christianity to Ireland, but he himself was British, with Roman parents. He was born in Wales or Scotland, not Ireland. It’s A Lucrative Holiday – In 2016, Americans spent a total of $4.4 billion on St. Patrick’s Day. That’s an average of $35.40 per person celebrating the big day. There Are No Female Leprechauns – Leprechaun scholars have come to the conclusion that there are no female leprechauns, nor has there ever been a female leprechaun. Where do they keep coming from, then? Some folklore says that they are the deformed and shunned children of fairies. Oh my! 25 Pounds Of Dye Turn The Chicago River Green – Lots of cities throw quite the party on St. Patrick’s Day, but no one does it quite like Chicago. On the day of the parade, at 9:15 a.m., the Plumbers Local hop on boats and dye the Chicago River an electric green color. It’s quite the sight to see, but it only takes 25 pounds of the dye to turn the entire river green for a few hours. St. Patrick Didn’t Wear Green – At least not to the extent that you might picture. His color of choice was actually a light shade of blue called “St. Patrick’s blue.” The whole green tradition came along when the independence movement in the 18th century used a flag of the bright green color. It’s Been Celebrated In Space – Not only is St. Patrick’s Day celebrated all across the globe, from Ireland itself to Asia, and South America to Canada, it’s also been celebrated in space. For example, astronaut Chris Hadfield posted a photo of himself all decked out in green on the holiday back in 2013. Here’s another way to save time when selling your house, list with me; I listed 2 properties last week, both were under contract within 24 hours! Would love to do the same for you! New Listing: Lake Front Living in Roswell!!! Updated & Move in Ready- Freshly painted inside, 2” blinds, updated lights, plumbing & more! Great Room-Just painted, hardwood floors & a cozy stone fireplace w/gas logs & glass doors! Separate Dining Area-Off great room & kitchen! Excellent for entertaining! Hardwood floor & ceiling fan! Kitchen –White cabinets, tile floor, updated door hardware & lights! Tons of cabinet & counter space! Fabulous Master Suite – Spacious room w/2” blinds, walk in closet, French door to deck & lake views! Marvelous Master Bath –Updated vanity, lighting & plumbing fixtures! Updated tile floor & shower! Split Bedroom/Roommate Floor Plan–Perfect for privacy! Second bedroom- Generous size room, NEW paint, big walk in closet & views of the lake! Updated Hall Bath-Freshly painted! Updated vanity, lighting & plumbing fixtures! Updated tile floor & shower! Top Floor, End Unit-Private entrance! Private Deck-Overlooking lake! Has extra storage too! Lake View – Enjoy the relaxing views of the Lake after a long day at work! Rare find; very few units on the Lake! Great Location-Walk to shopping, restaurants & Marta! Just minutes from the Chattahoochee River, parks & trails! Easy access to Roswell & Marietta Square, I-75, GA 400 & the new Braves Stadium!